There is something about the city air that makes my armpits itch vigorously on weekends. When I consulted 'Swami Asabhyananda' on this, he suggested that I should probably get out of the city before the weekend arrives. I had never thought of that possibility before, and I realized his holiness has to be the real deal... only God can give such profound enlightenment. I have been trying my best to follow this advice ever since. Though swami became in-famous recently through some of his videos, I firmly believe that it was his advice that saved me and my armpits all these days. So when Rob invited me home last weekend I was more than happy to oblige. Rob is the reigning prince of 'Mavileri', a small but prominent kingdom in North Kerala. To give you an idea of his wealth, he has 15 cows, 300 chicken, 40 sharks and 173 other miscellaneous fishes. Yes, people there still got their own ingenious ways of measuring wealth. This doesn't mean that they are behind the rest of the world in other areas like technology; they use calculators and wrist watches. If I continue ridiculing the lifestyle and culture of his people, Rob will banish me from his kingdom and it will seriously jeopardize my chances of going back there to examine the dragonfly fossils I found on the terrace of Rob's house. 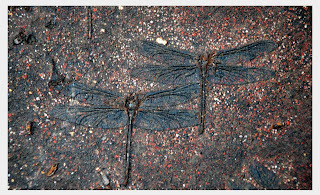 My best guess is that they belong to the 'mesozoic period', though Rob insists that these dragonflies were still around when he grew up there as a kid. Rob's house is a small 6 bedroom, 9 bathroom 'hut' in the middle of sixty acres of vegetation. They grow Rubber, Cashew, Coconut, Arecanut, Banana, Pepper and grade-A Marijuana there. Ok, I was kidding about the Marijuana, those were some stray plants which grew out of the seeds dropped by some pot-head birds in the locality. I reached this beautiful place on Saturday morning and as Rob had made up some good stories about me, his Mom and Grandmom were happy to welcome me in. After refueling with some tasty 'appam' and chicken curry, we decided to explore the place. Being a king, Rob has the luxury of having his 'own' hills, valleys and ponds in the property... even an underground tunnel! We walked through the cashew plantations towards the hill top and tried flying a kite. We barely managed to get the kite off the ground as the wind played spoilsport. As we were climbing down, we noticed a chameleon with a scorpion in its mouth. I wanted to take a picture of this guy and his unusual prey, but it ran away as if I was after the meal. One dead snake, one live snake, 17 sword tailed Drongos, 3 Tree Pies, 6 Bulbuls, 1 squirrel, few sunbirds, some tasty cashew fruits; and we were back in the house for lunch and some fresh toddy. In the afternoon we decided to take a drive and went to the snake park at Pappinisseri. It was lunch time for the crawlies there. The snakes are fed small chicks, 4 to 5 depending on the size. 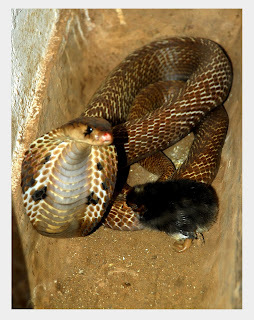 It was disturbing to see the clueless chicken running around the cage, at times even on the body of the snakes. The snakes waited patiently, as if letting the chicken enjoy their last few moments of fun. We were closely watching a Cobra who had his head up in the air, the hood in full display, having a silent conversation with his victim. Then he struck in a split second. The chicken fell down, twisted and turned a couple of times and submitted itself to the powerful venom. The meal was ready and he gobbled up the tasty bunch of flesh and feathers in no time. The park had an impressive collection of snakes, both venomous and non-venomous. The 16 feet long King Cobras who got air conditioned suites of their own were the biggest attractions. They were majestic and menacing at the same time! After the wind cheated us on the hilltop, we had decided to go fly the kite in the beach. So from the snake park we went to Kannur beach. 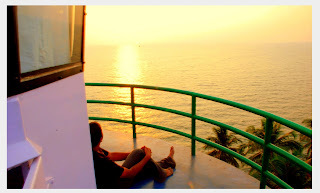 Luckily we got a chance to climb up the lighthouse by the beach and watch the sunset from there. It was amazing to see the vast blue ocean turning orange like a lake of fire, one of the most beautiful sights I have ever seen. 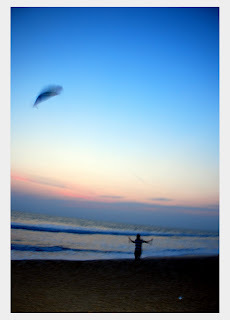 We soon moved to the beach and started playing with the kite, which we managed to get up in the air after a few efforts. We came back home to a delicious supper and slept off soon after. Rob went to church the next day morning like a good boy and I got some time to wander around the house and click pictures of birds, dragonflies and what not. Just before lunch we decided to take a dip in his royal pool. This is a 70 feet, shark infested swimming pool, where Rob has put some 40 sharks, but haven't seen any after that day. He told me they are swimming quietly in the depths, waiting patiently to grow big enough to attack and eat the juicy flesh that occasionally falls in. Anyway. we escaped without a shark attack that day. If the Catholic church ever decides to appoint a patron saint of ice creams, my vote goes for Rob. I don't know anyone else who can eat two bowls of 'Death by Chocolate' at one go and afterwards wash it down with a chocolate milk shake. Mind you, 'Death by Chocolate' is a mixture of chocolate chips, chocolate cake, chocolate syrup, chocolate ice cream and caramel served in a half-liter container! So when Rob told after lunch that he want to eat ice cream on cakes, everybody just nodded their heads. There was some more excitement left in the day in the form of badminton games. Rob had some great friends who play regularly with him. When George sir and Santhappan chettan told me they are 65 and 62 years old, I thought the game would be such a boring affair. But I was amazed at the agility and competitive spirit of them; Rob and myself won a doubles game against them at 14-12, after much sweating. It was fun playing badminton after a long time, that too with such an interesting group. I wish I would be in a situation to at least lift the racket when I turn 60. After some five games it was time for me to retire and plan for the return journey. Then came in this feeling I am so familiar with on Sunday evenings.. the momentary sadness of traveling back to daily life. Click here for some more pictures.